The Canon EOS Rebel T3i is this year’s entry-level digital SLR offering from Canon. This 18 megapixel digital SLR is relatively compact (for a mirror-equipped camera) and packs a swiveling 3 inch display, 3.7 FPS burst mode, full manual controls, RAW support and expandability you would expect from a camera this level, Full HD movie mode and more. The camera faces intense competition at this price point, from both entry-level SLR cameras made by Nikon and Sony as well as mirrorless interchangeable lens cameras from the likes of Olympus and Panasonic. And we’re going to take a look at how it fares in our in-depth review right now! As bizarre as usual, the camera goes by three different names: Canon EOS Rebel T3i in America, Canon EOS Kiss X5 Digital in Japan and Canon EOS 600D in Europe, Asia and everywhere else. The Canon EOS Rebel T3i takes SD, SDHC and SDXC memory cards but doesn’t come bundled with any memory (at least with Canon’s official bundles). You should consider starting out with an 8 GB high-speed SDHC if you don’t already have a memory card. The Canon EOS Rebel T3i can perform faster with a high-speed memory card (around Class 6 or 10 MB/s at least), so getting one is certainly recommended if you want the camera to perform at its full potential. The Canon EOS Rebel T3i uses the same LP-E8 lithium-ion rechargeable battery as its predecessor and comes with a dedicated battery charger. While the Canon Rebel T2i had a battery life rating of 470 shots per charge, the Rebel T3i here has a lower rating of 440 shots per charge. Compared to the other two conventional digital SLRs, the Canon EOS Rebel T3i has below average battery life – with the Nikon D5100 capable of 660 shots per charge while the Sony Alpha A65 gets 1050 shots per charge. With live view enabled, the Canon Rebel T3i’s battery life drops to just 180 shots per charge, which is still below average. The Canon EOS Rebel T3i (EOS 600D) is compatible with Canon’s full range of EF and EF-S series lenses with a 1.6X crop multiplier, which means that 18-55 mm kit lens is in fact equivalent to 29 – 88 mm in 35 mm terms. As expected from a digital SLR camera, the Rebel T3i is also compatible with a range of other accessories such as wired and wireless remote controls, external flashes, a battery grip, AC adapter and various camera cases. The Canon Rebel T3i is compatible with external flashes via its standard-sized hotshoe; it will take both Canon and third-party flashes, though only Canon-branded flashes will sync seamlessly and automatically with the camera. The Rebel T3i can also be expanded with a battery grip, which will take either two lithium-ion batteries or six AA batteries via an adapter tray. 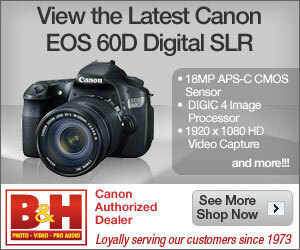 The Canon EOS Rebel T3i, aka EOS 600D, is compact for a digital SLR camera. At 133.1 x 99.5 x 79.7 mm (or 5.2 x 3.9 x 3.1 inches), the camera is by no means even near pocketable, but it will fit into most camera bags (or even a handbag) with ease. As you can see, the Canon EOS Rebel T3i is a lot smaller than a full-sized digital SLR like the Canon EOS 7D. The camera is made of plastic but has a metal inner frame so it does feel well put together. The camera is fairly ergonomic with controls placed well within reach of both hands, and though the Canon T3i does lack the rear control dial of pricier EOS cameras, this design is inline with previous entry-level Canon Rebel models. And one last comparison before we move on: the Canon Rebel T3i, aka EOS 600D, is shorter, lighter and a lot lower profile than your average digital SLR. That means the grip, while appreciated and lets you steady the camera, may be relatively shallow or small for some people’s liking – the workaround is the same with every entry-level Rebel that Canon has released, that is to get the optional battery grip for the camera. On the front of the Rebel T3i is the Canon lens mount that takes both Canon EF and EF-S lenses. The camera has a sensor that is smaller than 35 mm full frame, so there’s a 1.6X multiplier for all the lenses that you mount on the camera (ie, the 18-55 mm kit lens becomes equivalent to 29-88 mm). As with other Canon digital SLR models, the Rebel T3i relies on optical image stabilization built into lenses, which means you’ll have to lookout for the “IS” designation if you want image stabilization in your lens. The advantage of in-lens stabilization is that it can be used while recording movies and that it can be slightly more effective than in-body stabilization. The Rebel T3i has the standard Canon 3-tier dust prevention, reduction and removal system: the sensor has anti-static coating to help prevent dust from adhering to it, there’s ultrasonic vibrations the T3i can send whenever you turn the camera on/off (or anytime via the menu) and finally, there’s software dust mapping which allows you to set the points of stubborn dust you can’t remove so the bundled Digital Photo Professional software can remove the spots digitally in your computer. To the direct right of the lens mount is the button to release the lens so you can swap it out for another lens. Towards the left side, you’ll find the Rebel T3i’s compact grip, self-timer countdown/redeye reduction lamp as well as wireless remote receiver on the grip itself. The last thing to be seen on the front of the Canon Rebel T3i is the popup flash. The flash is quite powerful and above average in terms of range, with a guide number of 13 meters at ISO 100. The flash also does the job of helping the camera focus by emitting strobes of light when conditions are dark… of course, you’ll have to pop the flash up for that to happen, and if you don’t want a photo to be taken with flash, you can close the flash right after focusing is done. The Rebel T3i sports the same lovely 3 inch display as its predecessor with a twist: it’s now mounted on a hinge which allows you to flip it out and rotate it. The LCD has the same whopping 1.04 million dots as before, making it very high in resolution and sharp. The hinge mounted display makes it very flexible, allowing you to rotate it upwards or downwards for above-head shots or knee level shooting. The display can also be closed towards the camera to protect the LCD when not in use. The LCD can be faced forwards for self-portraits too! In terms of legibility, the display has decent visibility in bright light and good viewability in low-light. With that display out of the way, let’s move on to the camera’s viewfinder. The camera’s optical viewfinder is average in size for an entry-level digital SLR, covering 95% of the frame and has a magnification value of 0.85X. The viewfinder has dioptric correction for glasses wearers, adjustable using the knob to the upper right of the viewfinder. Flanking the viewfinder of the Canon EOS Rebel T3i are three buttons: to the left are Menu and Info buttons, and on the right side is the button to toggle live view. That same button also doubles as the movie start/stop when you have the camera’s mode dial at the ‘movie’ position. To the right of the display are more buttons, which thankfully are straightforward in nature and easy to explain. The top most button is the exposure compensation button, which doubles to switch between adjusting shutter speed and aperture in full Manual mode (a necessity since the Rebel T3i has just one control dial). The next button with the Q on it is the Quick Menu button, which lets you move about and adjust various options seen in the Quick Menu screen using the navigation pad. The Rebel T3i offers many white balance options, including a custom white balance mode. There’s also the ability to tweak those individual settings via the white balance shift grid in the blue/amber and magenta/green directions as well as use white balance bracketing in either one of those directions. Unlike more expensive Canon models, the Rebel T3i lacks Kelvin color temperature based adjustment for white balance, for which you’ll have to step up to the EOS 60D or higher to get the function. The Rebel T3i also sports a bunch of Picture Style settings that affect how your pictures turn out, and also adds an Auto Picture Style option which allows the camera to decide what settings to pick based on shooting conditions. You can adjust the sharpness, contrast, saturation and color tone of each Picture Style, and even download new sets and load them into the camera via the bundled software. In monochrome mode, the last two options are replaced with options to adjust filter and toning colors. Below the navigation pad are two more buttons: one for entering playback and the other for deleting photos. Over on the upper right corner, you can spot the camera’s speaker and yet another two buttons. Those buttons handle exposure lock and focus point selection respectively (both customizable via the Custom Function menu you’ll see later in this review), and double as zoom in/out controls in playback mode. The top of the Rebel T3i houses a few more things. You’ll see the flash hotshoe where you can mount an external flash that fits; though only Canon EX-branded Speedlites will sync automatically with the camera. The camera has a flash sync speed of 1/200 sec as it has been for many years with Canon’s entry-level digital SLR models, though the Rebel T3i is the first ever in that line to support wireless flash control – You can set up to 2 groups of Canon branded flashes that support wireless control. Moving on, there’s the mode dial which consists of a bunch of shooting modes. The camera has the manual controls you would expect from a digital SLR: program mode, shutter and aperture priority as well as full manual mode are all present. The camera follows the aperture range of the lens mounted, which in the case of the Canon EF-S 18-55 mm kit lens is f3.5/f5.6 to f22/f36, and has a shutter speed range of 1/4000 to 30 seconds, plus bulb mode for those who shoot for minutes in the dark. The camera has just five scene modes (portrait, landscape, closeup, sports and night portrait) and two reworked auto modes. The first auto mode, called Intelligent Auto (and denoted by the A+ icon on the mode dial) is simply your regular auto mode with the added ability for the camera to automatically detect shooting situations and pick the appropriate scene mode and settings for it. The next mode, Creative Auto, is more interesting and fancy. Creative Auto is gives beginners the easiness of Auto mode with some control you’ll find in manual mode, but with simplified terms such as “Blur/sharp background” (affects camera aperture value) and “ambience selection” (in place of Picture Styles and other image settings). To the right of the mode dial is the camera’s power switch, and above that are two buttons: Display (turns the camera’s LCD on/off) and ISO (allows you to select between Auto ISO and anywhere between ISO 100 – 6400. You can also expand the ISO range of the camera to 12800 via the Custom Functions menu. Towards the grip area are the camera’s shutter button and control dial. The control dial is used to adjust aperture and shutter speed (though just one at a time in Manual mode) as well as other camera settings. Behind door number one, we have ports for the optional wired remote control and external microphone (if you choose to use one for better sound quality with movies). And behind door number two are the USB + A/V out and HDMI ports. There’s less action on the other side of the Rebel T3i, with the only thing to see here being the SD/SDHC/SDXC memory card slot with a compartment door of decent quality. At the bottom of the camera, you’ll see the metal tripod mount which is inline with the lens and battery compartment. The door has decent build quality and is user-removable so that you can fit in the optional battery grip insert. The Canon EOS Rebel T3i has a decent optical viewfinder as well as live view display shown above. The camera really just tells you everything you need to know about your photos in live view mode, including a big live histogram if you choose to toggle it and framing gridlines. There’s also a 5-step battery indicator though you don’t get the super precise percentage indicator as you would find on higher end EOS cameras. The Canon Rebel T3i has a decent number of menu items, contained in four shooting option tabs. The notable things in here include vignetting reduction (peripheral illumination correction), flash control (with the ability to adjust settings on Canon flashes directly from the camera), exposure bracketing, contrast improvement (auto lighting optimizer), color space and Auto ISO range. The fourth menu tab contains mostly live view related settings, where you can select focus mode, framing grid display and image aspect ratio. The camera has two main focus modes: live mode (you can choose between selectable focus points or face detection) or quick mode. The former mode focuses just as a compact camera would (contrast detection based), while quick mode does a lot of mirror flipping to use the regular phase-detection based system of digital SLRs; sure the process is audibly noisy and live view blacks out for the moments when the mirror has to flip but it surely is faster than live mode. The setup menu on the camera contains mostly a self-explanatory list of settings where you get to customize the Rebel T3i’s core settings like time and date. That’s not a lot of custom functions compared to the huge lists of more expensive EOS cameras, and certainly very digestible and will not overwhelm beginners using the Rebel T3i. The camera also has a customizable My Menu page which allows you to add up to 6 settings in total from any section of the camera’s menu system (custom functions included) and quickly access them on this tab. The Canon EOS Rebel T3i has a movie mode that’s on-par with other Canon SLR cameras. The camera allows you to record up to Full HD movies (1920 x 1080) with mono sound, though the Rebel T3i supports stereo sound recording if you attach an external microphone to the port on the camera. You can choose to let the camera shoot movies automatically or use the various manual controls available to you. Lens zoom, shutter speed and aperture value can be adjusted while recording movies, while you can change ISO, microphone sensitivity and toggle the wind filter before starting a video. You can also take a still photo while recording movies; there will be a brief pause when you snap a picture in full resolution and the camera will pick off recording automatically in the same movie file. Two new additions Canon has made to their EOS cameras are here on the Rebel T3i: movie digital zoom up to 10X and Video Snapshot which allows you to shoot brief video clips up to 8 seconds each to be compiled later. The only thing the camera cannot do is focus continuously while recording movies, since live view focusing speeds are too slow for that… you do get the option of getting the camera to refocus by half-pressing the shutter button while recording, or manually focus. Performance testing of the Canon EOS Rebel T3i/EOS 600D was done using a high-speed 45 MB/s Sandisk Extreme Pro SDHC card. The Canon EOS Rebel T3i does well for a digital SLR camera. As expected, startup is almost instantaneous and there is very little delay between shots: the camera can shoot as quickly as you can press the shutter button until the buffer fills up. As with other interchangeable lens cameras, the autofocus performance of the Canon EOS Rebel T3i can vary greatly depending on the lens being used on the camera. Obviously more expensive lenses and Canon’s L-series lenses focus much faster than the super basic Canon 18-55 mm kit lens bundled with the camera, but focusing speeds with the 18-55 mm are still good and definitely faster than on a compact camera. The camera doesn’t perform as well in focusing speeds with live view toggled on, which has nothing to do with the choice of lens used but more of the camera’s sensor contrast-detection focus technology. Slow live view focusing is also an issue with other standard SLR models by Canon and Nikon. Live view does come in handy with the flexibility of the rotating LCD as well as ‘what you see is what you get’ on-screen preview, but for most shooting purposes, I recommend using the optical viewfinder for better battery life and MUCH faster focusing. The Rebel T3i aka EOS 600D has a burst mode that can shoot as quickly as 3.7 frames per second. The camera can take 3 RAW + JPEG, 6 RAW or 30 full-resolution JPEG photos in a row which isn’t a lot but that’s what you get with an entry-level digital SLR. The Rebel T3i aka 600D performs well in terms of image quality, with smooth and clean images from ISO 100 all the way up to ISO 1600. At ISO 3200, image quality becomes a tad noisy but still very usable and comparable to ISO 400 or 800 on modern compact cameras. The Rebel T3i allows you to disable long shutter and high ISO noise reduction via its Custom Functions menu; I had both turned off when shooting the test photos above as well as images in the Rebel T3i photo gallery. Lens performance of the camera depends on the choice of lens being used on the camera. Paired with the EF-S 18-55 mm kit lens, the Canon Rebel T3i doesn’t perform too impressively, with slight lens distortion and below average sharpness. As a result, things are not as sharp as they could be. With a Canon L-series lens attached, things became much better on the camera. The camera has built-in vignetting correction if you choose to enable it (called Peripheral illumination correction by Canon) but does not have lens or exposure microadjustment found on more expensive EOS models. The Canon Rebel T3i is a good performer in image quality with low noise and vivid colors, though the camera definitely favors better lenses if you would like the most out of image quality. With any of the kit lenses, image sharpness and colors are just ‘average’ but slap on a more decent lens purchased separately from the camera and you’ll see a noticeable increase in those characteristics (depends on lens);the same applies when buying any digital SLR in general. Visit the Canon EOS Rebel T3i aka EOS 600D photo gallery to view photos taken using the camera. The Canon EOS Rebel T3i aka EOS 600D has a pretty fancy playback mode for a Canon digital SLR. The camera has the usual basic functions like image rotation, protection, resizing, print marking and playback zoom up to 10X. The camera also features a fancy slideshow mode with transition effects and background music. There’s also five Creative Filters to choose from so you can add effects to photos: black and white, soft focus, fisheye, toy camera and miniature effect. On the movie side of things, there’s a basic trimming tool which allows you to cut the start/end of movie clips. What’s still missing is a RAW image processing tool where some cameras allow you to convert RAW images into normal JPEG files directly from playback mode. The camera also lacks any redeye removal or image brightening features in playback mode. The Canon Rebel T3i displays everything you need to know about your pictures, including a brightness and RGB histograms and exposure information. The Canon EOS Rebel T3i, also known as the Canon EOS 600D, is an entry-level digital SLR that’s definitely worth a look. The camera is an evolutionary step up from the Rebel T2i (EOS 550D) but introduces a handful of appreciated features such as the rotating 3 inch display, wireless flash control and improved Auto mode. The Rebel T3i has the usual SLR features like RAW image mode, full manual controls and support for interchangeable lenses (Canon has lots!) and flashes. The Canon Rebel T3i is relatively compact in size while having a decent amount of controls spread over in accessible and ergonomic places. Some may complain that the Rebel T3i’s grip is too small, but that’s what you get with an entry-level model; beginners probably won’t be using the camera for very long periods for it to matter and for those who do, the EOS 60D is not much more expensive and has a beefier grip. The Rebel T3i also has a decent viewfinder which shows exposure information (including ISO) and other basic shooting info in the line beneath the viewing area, as well as a very detailed live view screen. The camera is very versatile with an improved Scene Intelligent Auto mode and Creative Auto adjustment for beginners, but also gives enthusiasts and seasoned users their dose of full manual controls. White balance, Picture Style, drive mode, autofocus mode and ISO are all easily accessible via their own buttons. There’s also that excellent 1080p Full HD movie mode, which is about as good as you can get on a digital SLR until that $6800 Canon EOS 1DX comes to the market in February 2012, but not exactly ‘perfect’ due to the large file sizes of movies and the slow live view focusing of the Rebel T3i, which makes continuous focusing a no-go. Performance in speed and image quality is also good with quick shooting abilities and write speeds paired with clean and detailed photos with low noise. The Rebel T3i could’ve benefited from a larger buffer though, and really needs faster autofocus in live view mode… which pales in comparison with competing interchangeable lens cameras (which are live view only with no optical viewfinder) having already reached SLR-like focusing speeds. Image quality of the Rebel T3i is certainly commendable, though the bundled kit lenses are not; they have a tendency of making photos soft looking, which makes stepping up to a decent to excellent lens a good choice as they will bring a noticeable improvement in sharpness and other lens qualities (some recommendations for better walkaround lenses would include the EF-S 15-85 mm, EF-S 17-55 mm and EF 24-70 mm). The Canon EOS Rebel T3i is a good pick for anyone looking for an SLR camera thanks to its solid feature set for an entry-level model and Canon’s large range of lenses and accessories. It’s an even more appealing choice if you are looking for a whole SLR system to invest in (ie if you plan to grow your lens collection instead of sticking to the bundled kit lens forever) or for existing Canon EOS owners who want a smaller/lighter second camera body.